Solid-state capacitor is called solid-state aluminum electrolytic capacitor. The biggest difference between it and ordinary capacitors (i.e. 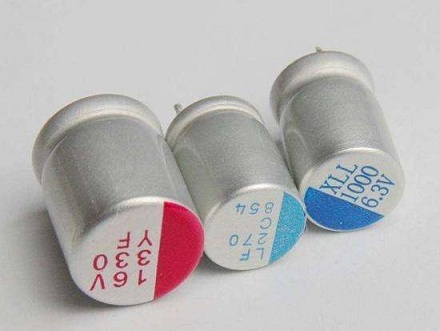 liquid aluminum electrolytic capacitors) lies in the use of different dielectric materials. The dielectric materials of liquid aluminum capacitors are electrolyte, while the dielectric materials of solid capacitors are electroconductive polymer materials. In view of the many problems of liquid electrolytic capacitance, solid aluminum electrolytic capacitor has emerged as the times require. Since 1990s, solid conducting polymer material has been used as cathode instead of electrolyte for aluminum electrolytic capacitor, which has achieved great development. The conductivity of conductive polymer materials is usually 2 ~ 3 orders of magnitude higher than that of electrolyte. The application of aluminum electrolytic capacitors can greatly reduce the ESR and improve the features of temperature frequency, what’s more, because of the good processability of polymer materials, it is easy to be packaged. All are greatly promote the development of aluminum electrolytic capacitance. There are two kinds of aluminum electrolytic capacitors in the market: organic semiconductor aluminum electrolytic capacitors (OS-CON) and polymer conductor aluminum electrolytic capacitors (PC-CON). 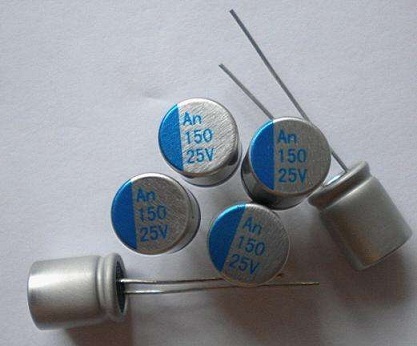 The structure of organic semiconductor aluminum electrolytic capacitor is similar to that of liquid aluminum electrolytic capacitor, both are adopt straight-pin and vertical package. The difference is the cathode material of solid aluminum polymer electrolytic capacitor using the organic semiconductor extract, which can effectively solve the tough problems of electrolyte evaporation, leakage, flammability and so on. In addition, solid aluminum polymer patch capacitor is a unique structure formed by combining the characteristics of aluminum electrolytic capacitance and tantalum capacitance. Like liquid aluminum electrolytic capacitors, solid aluminum polymers are mostly in the form of patches. The film of polymer electrode with high conductivity is deposited on alumina as cathode, carbon and silver as extraction electrode, which is similar to the structure of solid tantalum electrolytic capacitance. 1. With high stability, the solid aluminum electrolytic capacitor can work stably in high temperature environment, and improve the performance of motherboard directly. At the same time, it is suitable for power filter because of its stable impedance in wide temperature range, provide stable and abundant power supply effectively, especially in overclocking. 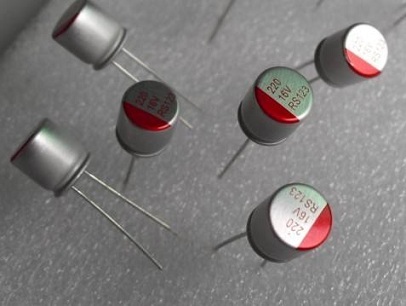 Solid-state capacitors can work at high temperatures and maintain various electrical properties. The capacitance changes less than 15% in the whole temperature range, which is obviously superior to the liquid electrolytic capacitance. Meanwhile, the capacitance of solid state electrolytic capacitor is independent of its working voltage, so it can work stably in the environment of voltage fluctuation. 2. The solid-state aluminum electrolytic capacitor has an extremely long service life (over 50 years). It longer than the liquid aluminum electrolytic capacitance. And it will not be broken down, nor need to worry about liquid electrolyte drying and leakage affecting the stability of the motherboard. Solid-state electrolytes do not expand or even burn as liquid electrolytes do at high temperatures. Even if the temperature of the capacitor exceeds its limit, it just melts, which does not cause the capacitor metal shell to burst, so it is very safe. The working temperature has a direct effect on the life of electrolytic capacitance. Advantages of its electrolyte make a longer service life than liquid electrolytic capacitor under different temperature conditions. 3. Low ESR(Equivalent Series Resistance) and high mA rms are important indexes of capacitance. The lower the ESR, the faster the charge and discharge speed of capacitance. It directly affects the decoupling performance of microprocessor power supply circuit, which is more obvious in high frequency circuits. Therefore, it can be viewed the biggest difference between solid state electrolytic capacitance and liquid capacitance. Solid aluminum electrolytic capacitance with the lower ESR and energy dissipation under high power operation condition can fully absorb the high amplitude voltage between the power lines in the circuit and prevent its interference to the system. When the CPU changes from low power state to full load state, the transient (generally less than 5 milliseconds) power required for this CPU switch comes from the CPU power supply circuit, at this moment, the high peak current can be output instantly by the high speed charge-discharge characteristic of solid state capacitor, which can guarantee sufficient power supply and ensure the CPU to work stably. According to the medium can be divided into inorganic dielectric capacitors, organic dielectric capacitors and electrolytic capacitors three categories. 1. Inorganic dielectric capacitors: including familiar ceramic capacitors and mica capacitors, we will often see ceramic capacitors on CPU. Ceramic capacitors have excellent comprehensive properties and can be used in GHz-class UHF devices, such as CPU/GPU, thus its price is also very expensive. 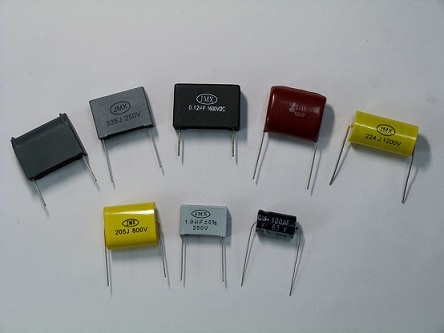 2.Organic dielectric capacitors: such as thin film capacitors, which are often used in loudspeakers with their precision, high temperature and high pressure resistance. Electrolytic capacitors: known as aluminum capacitors. The traditional method of classifying electrolytic capacitors is based on anode materials, such as aluminum, tantalum, or niobium. However, this method of judging capacitance performance based on anode is out of date. At present, the key to determine the performance of electrolytic capacitance lies not in anode, but in electrolytic, cathode. According to the classification of cathode materials, electrolytic capacitors can be divided into electrolyte, manganese dioxide, TCNQ organic semiconductors, solid polymer conductors and so on. The dielectric of liquid electrolytic capacitors is liquid electrolyte: liquid particles are very active at high temperature and have a low boiling point to the internal pressure of the capacitor, so it is easy to explode. The solid state capacitance is made of polymer dielectric: at high temperature, the particle growth and activity of solid particles are lower than that of liquid electrolyte, and its boiling point is as high as 350 degrees Celsius, so it is almost impossible to explode. It is shown that the ESR of solid state capacitance in high frequency operation is very small, and the conductivity is very good. It has the characteristics of reducing impedance and lower heat output, which is the most obvious between 100KHz and 10MHz. The traditional electrolytic capacitance is easy to be affected by the temperature and humidity of the operating environment, and is less stable at high and low temperature. Between minus 55 degrees Celsius and 105 degrees Celsius, the ESR of the solid capacitance can be as low as 0.004~0.005 ohms, but the electrolytic capacitance changes with temperature. In terms of capacitance values, the liquid capacitance below 20 degrees Celsius will be lower than the indicated capacitance value, and the lower the temperature, the lower the capacitance value will be. At minus 20 degrees Celsius, the capacitance will decrease by about 13 percent, and the capacitance at minus 55 degrees Celsius will reach 37 percent. Therefore solid state capacitors are guaranteed not to be affected by lower temperature, because the solid capacitance drops by less than 5 percent at minus 55 degrees. Solid state capacitors do have many advantages, but they are not always applicable. The low-frequency response of solid-state capacitance is not as good as electrolytic capacitance. In other words, a motherboard with all-solid-state capacitance is not the most reasonable. Whether solid or electrolytic capacitors, their main function is to filter clutter, so long as the capacity and quality of capacitance can reach a certain requirements, it can also ensure a stable operation. Solid state capacitors at 105C have the same lifetime as electrolytic capacitors for 2000 hours. When the temperature drops, their lives increase, but the solid-state capacitors increase even more. In general, the operational temperature of the capacitor is 70 degrees or less. In addition, the service life of solid-state capacitance can last 23 years, almost six times than the electrolytic capacitance. Compared with electrolytic capacitors, the capacity of electrolytic capacitors is much larger than that of solid capacitors at the same volume and voltage. At present, solid capacitors are mostly used in the CPU power supply of computer motherboard, but the capacity redundancy is very little, it is necessary to improve the the switch frequency of the part of CPU power supply. Both solid and electrolytic capacitors will have the problem of capacity attenuation in the process of use. However, although the capacity of the circuit board with solid state capacitance fluctuates slightly, the power supply will appear ripples, which will cause the CPU to work improperly. Therefore, the lifetime of solid-state capacitor is very high theoretically, but not in practice. Maintenance when using solid state capacitor computer board: the power supply part of CPU is often connected with multiple capacitors, so the solid state capacitance will not have deformation, explosive slurry, leakage, etc. There is no way to determine which one is out of order basically. Therefore, in maintenance, one of them is often removed (no matter good or bad), and a large capacity capacitor can be replaced (often with electrolytic capacitance). This method can usually solve the problem quickly. In theory, the lifetime of solid state capacitor is very long, but there will still be a lot of faults in the process of practical use. At present, it seems that most motherboards with overclocking as the selling point put forward by many manufacturers will use solid-state capacitors. But it is not the capacitance that determines the performance of CPU. The design of circuit, the development of BIOS, the quality of CPU itself and the heat dissipation measures may determine the success or failure of CPU.